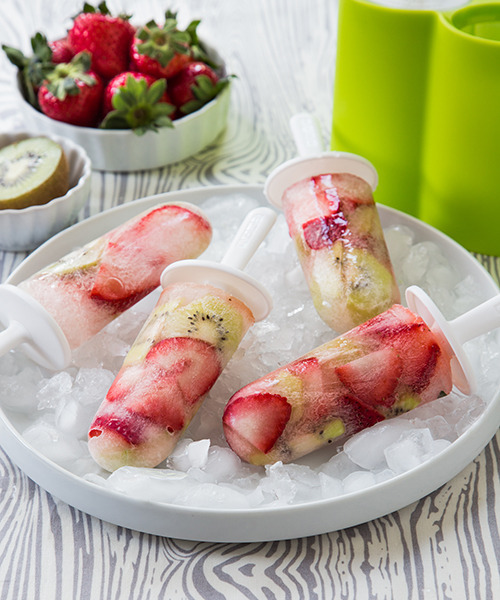 Arrange fruit slices into each Zoku Classic Pop mold. If desired, use a chopstick to neatly arrange the fruit. Pour the sparkling water into each mold, stopping just below the fill line. Place handles in Zoku Classic Pops and freeze for 8 hours. Run Zoku Classic Pops under warm water for a few seconds to help release pops. Classic Pop Molds lets you create six pops in a classic shape. The Classic Pop Mold is available for purchase here.